Are you headed to the beach? Or maybe making your way back? If you’re missing the sand between your toes already, try making these Beach and Water Cupcakes. 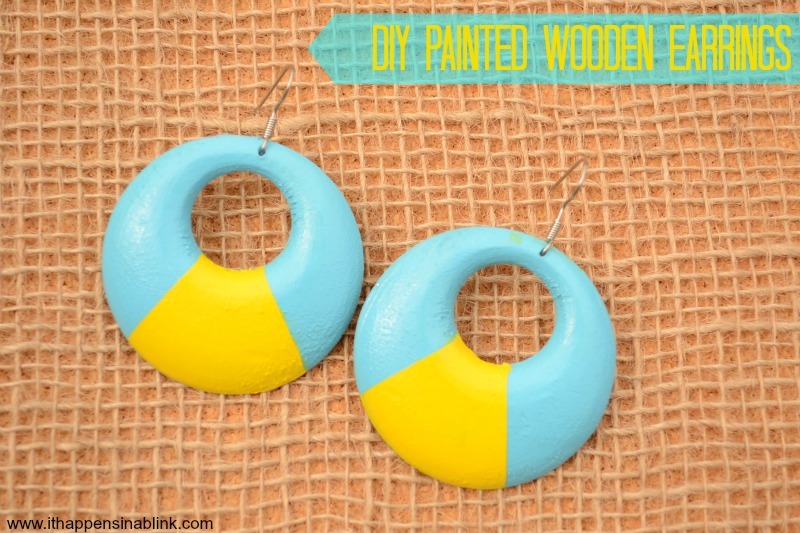 If you’re wanting a splash of beachfront in your daily wardrobe, paint a pair of fun wooden earrings. 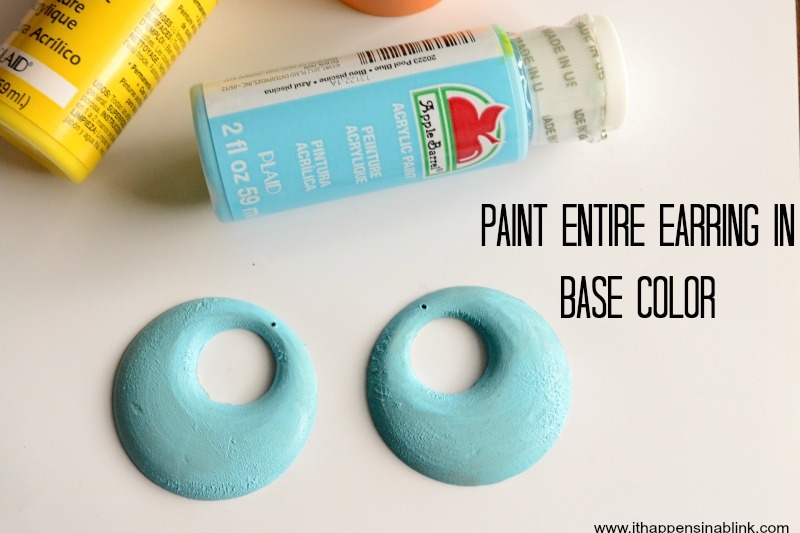 Begin by painting the earrings in one solid color. 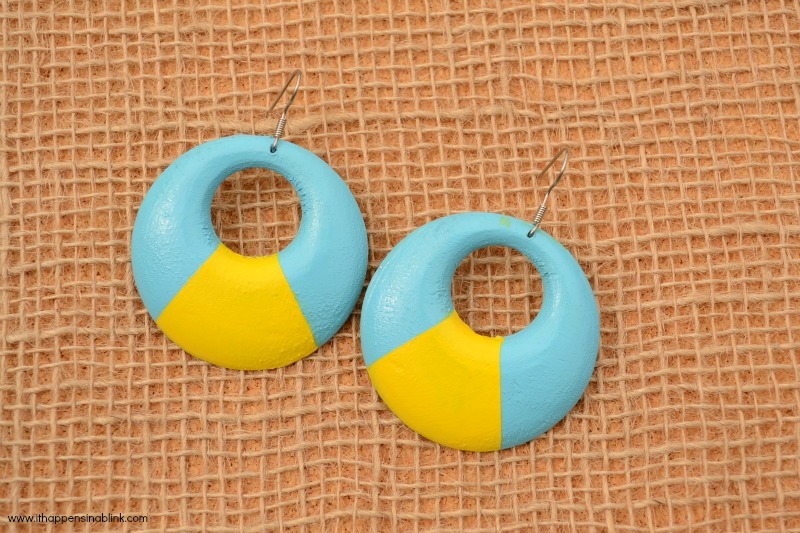 I painted the front and the back of the earrings. Since I was painting on bare wood, it took several coats to completely cover the wood. Do as many coats as it takes and let dry completely. Mark off an area on the front of each with washi tape. Be sure the washi tape is pressed down well with no air bubbles to prevent paint bleed. 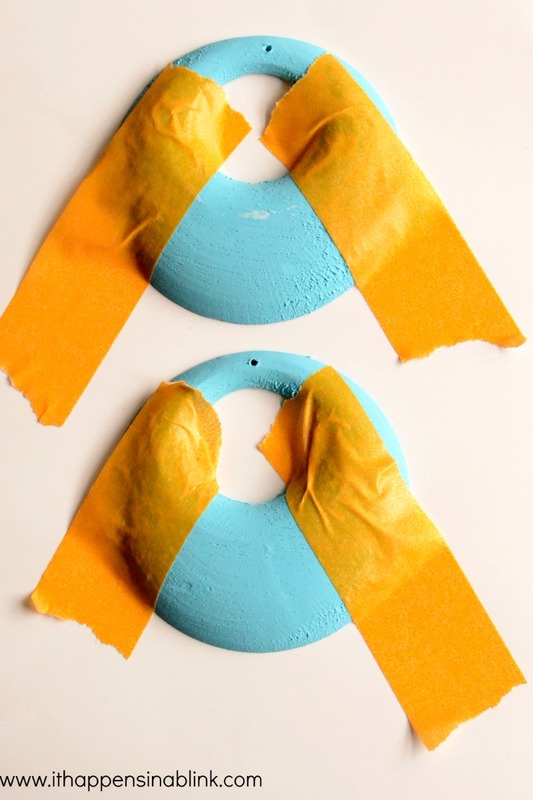 Paint the secondary color in between the washi tape. 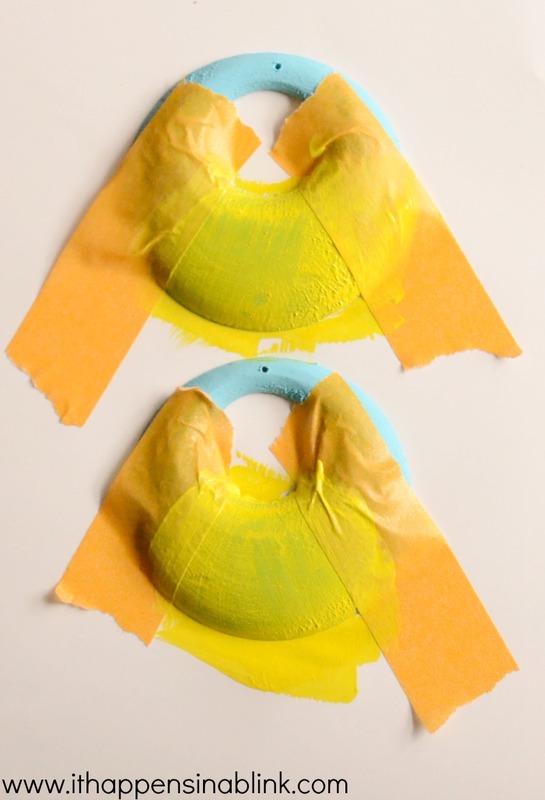 I painted a total of seven coats of yellow before the blue was covered. Let dry completely and remove the washi tape. Flip earrings to back side. 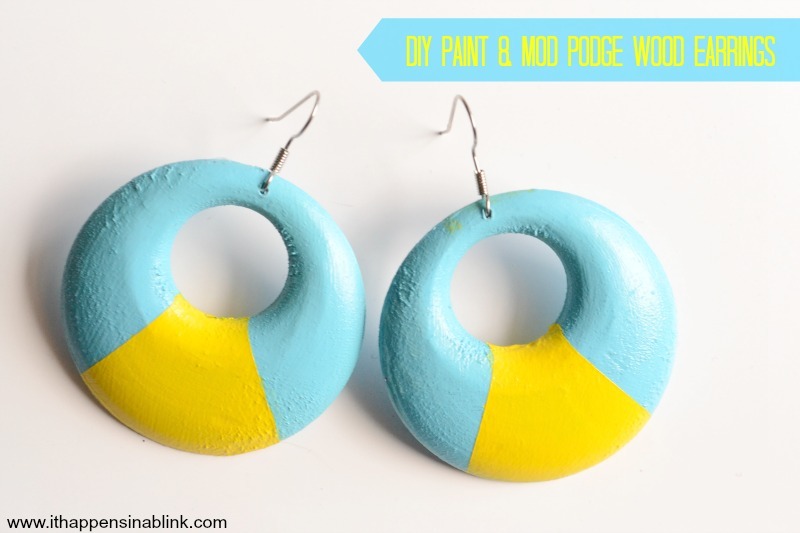 Matching paint lines on front, apply washi tape to back of earrings. Paint completely and let dry. If the hole in the top of the earring is covered at this step, push a pin or needle through it to ensure that it is open. 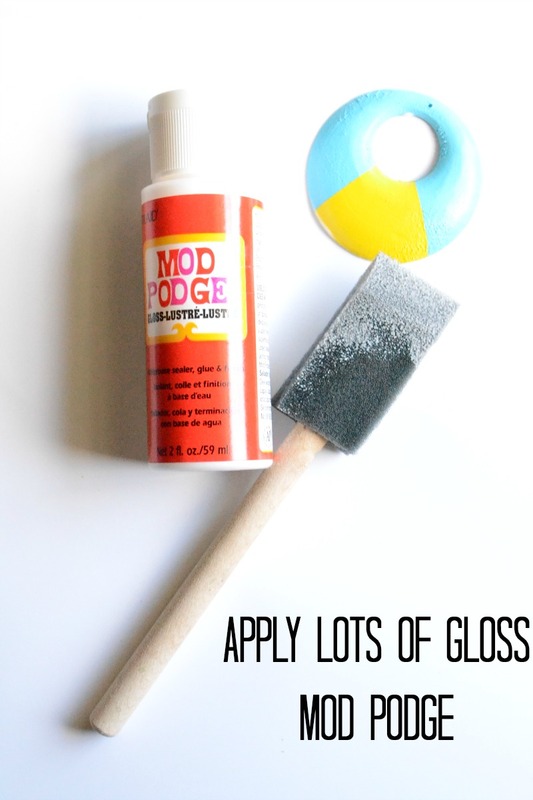 Using the foam applicator sponge, apply Gloss Mod Podge over entire earring front and back. Let dry. I applied a second coat, as well. Let all coats completely, preferably for a 24 hour period. 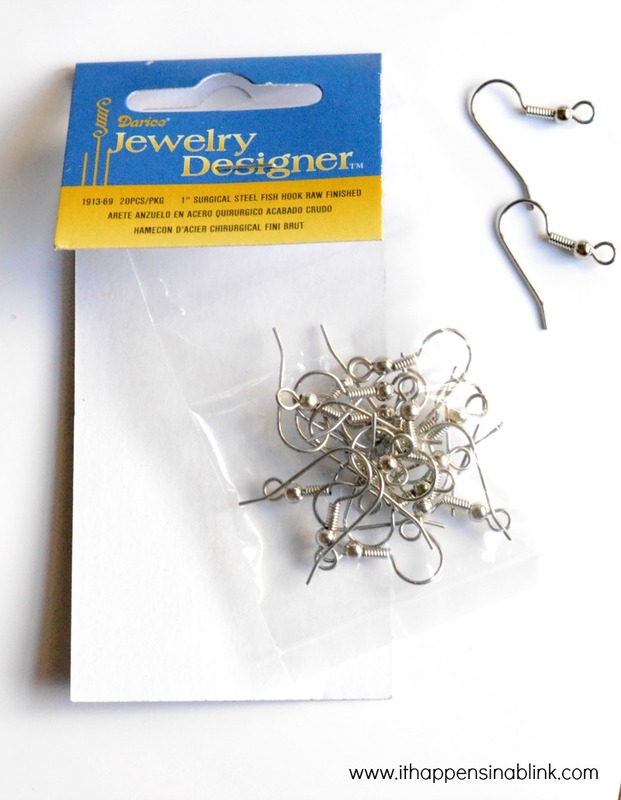 With small pliers, open the earring hook and slide the wooden earring hole over the hook. I did have to remove a ball portion from the hook to make the earring fit. Close the hook over the top of the earring with the pliers. Enjoy these fun summer earrings! Oh wow those are so easy and cute! Great gift idea that kids could help with. Oooh… love these! I’ve been wanting to dip my toes into jewellery-making water. These look like a craft I could tackle! Great job! I don’t make much jewelry, Tara. I just don’t feel like I know what I’m doing! But this was simple enough for even me! Those turned out super cute! Love the color blocking!! Super cute, Melanie! So cute!! Love the colors! How crafty! A perfect pair of summer accessory indeed. Nice job, that turned out great. Wow those are super cute! Cool Idea! I wish I was more crafty! I am more of a technical person though. What a very cute idea. Wow! I’m not very creative so I would not have thought of anything like this but thanks for making it look so easy, especially with the images! These are beautiful! I love the summery colors that you used! Very Cute!! You did an awesome job! How adorable! I’ll bet my teen and her friends would love a project like this. Thanks for sharing! They are so cute and you did a great job. Very crafty. I love it. LOVE!! The colors are awesome!! Those are so cute! I agree that they’re perfect for those beach days. Love these, super cute idea and so easy! Thanks. 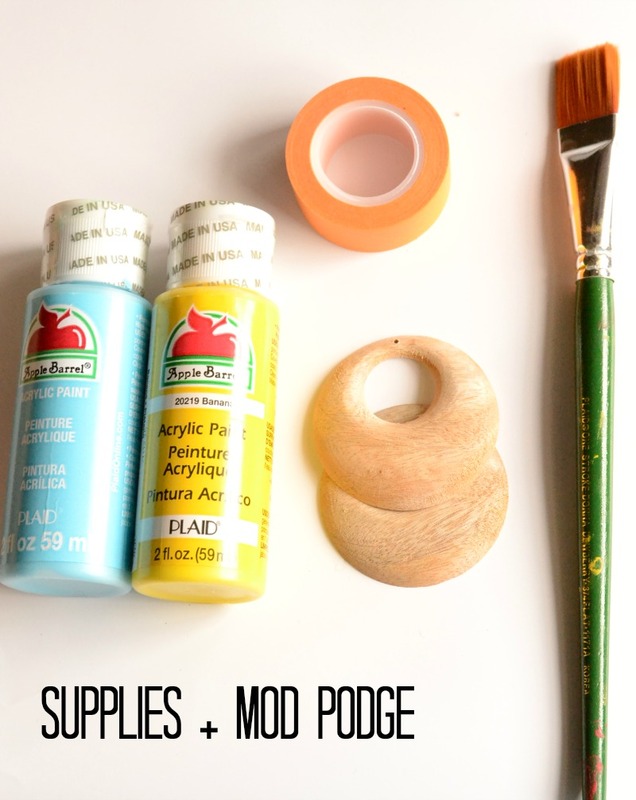 What a simple DIY and so cute too! So fun, your earrings turned out beautiful!